I feel like an ENORMOUS drum-roll should precede this post. You've all been waiting to see Amelia's room for so long now, and today is the day you FINALLY get to see the space she gets to come home to! 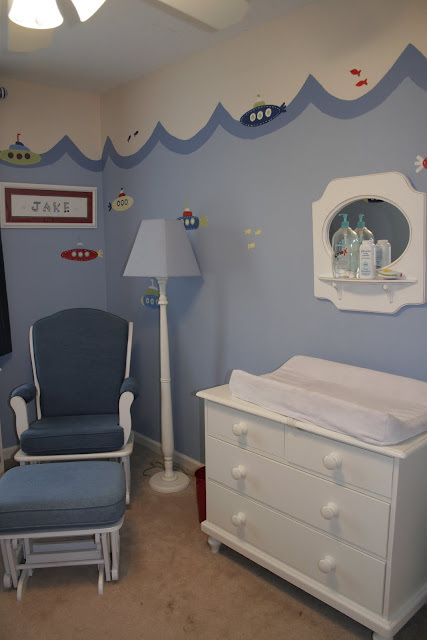 As a reminder, this was the boys' nursery, which was my starting point. 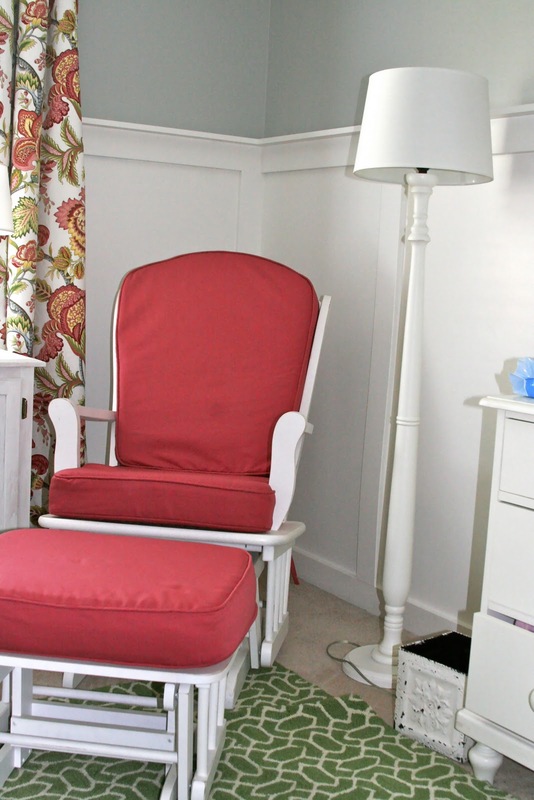 You can see that transforming it into a girl's space was going to take a little bit of work! I didn't purchase the exact prints that Rene picked out for the crib wall, but I went with similar ones. I'd Pinned a couple of these at some point and realized that if I didn't use them in Amelia's room, I likely wouldn't ever find another place to use them. I ordered them from The Wheatfield on etsy. The watercolor above the changing table was painted by our family friend Dottie, who has done a custom name watercolor for each of our kids. I would have used the pelican print here -- and therefore been stretching my design style a bit -- but it's really large and wouldn't fit above the wainscoting once it was framed. The laundry hamper isn't actually going to sit that far out into the room, but right now there are still about five Rubbermaid containers sitting over there by the crib. I knew you all wanted to see the room so I went ahead and took the pictures, but this is one of the "tweaks" that remains to be made. Just pretend like that hamper is tucked back in the corner. In that picture you can also see the infamous green rug, which Jake christened with baby powder not too long ago. I ended up purchasing the rug in a larger size than what Rene had priced out, because when I taped the rug size off on the carpet, it looked like a bathmat. Rene was trying to stay within my budget, which I appreciated, but I cut out a couple of things to make way for the larger rug. A friend who lives nearby took my old blue Pottery Barn chair cushions and used them as the template for the new raspberry cushions. 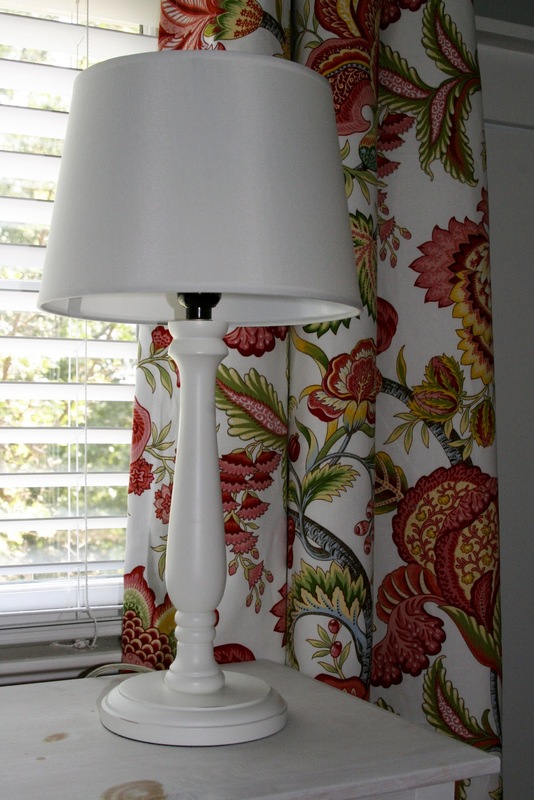 I love the pop of color the cushions make in this corner! This bookshelf isn't anything to write home about, but I've had it since I was in middle school and it's certainly serviceable. 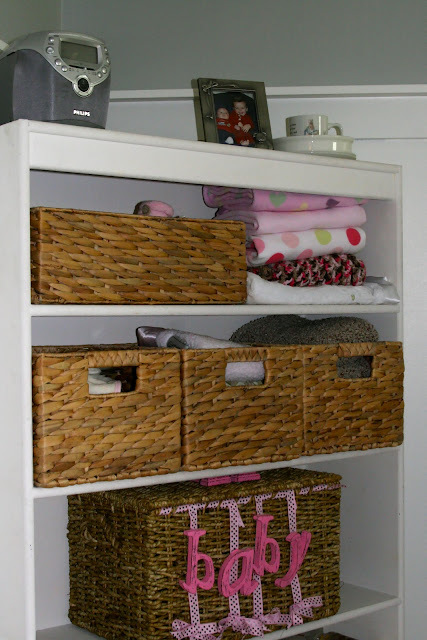 I just bought a few baskets to store blankets, socks and miscellaneous other items that won't fit in the drawers. The basket that says "baby" was a gift from our babysitter Anna. As for closeups of a few elements in the room, here's a better view of the watercolor that Dottie painted. She used the curtain fabric as her color inspiration, and I think she did a great job! Here are some closeups of several of the etsy prints ... I love how the bright colors pop off of the grey walls. 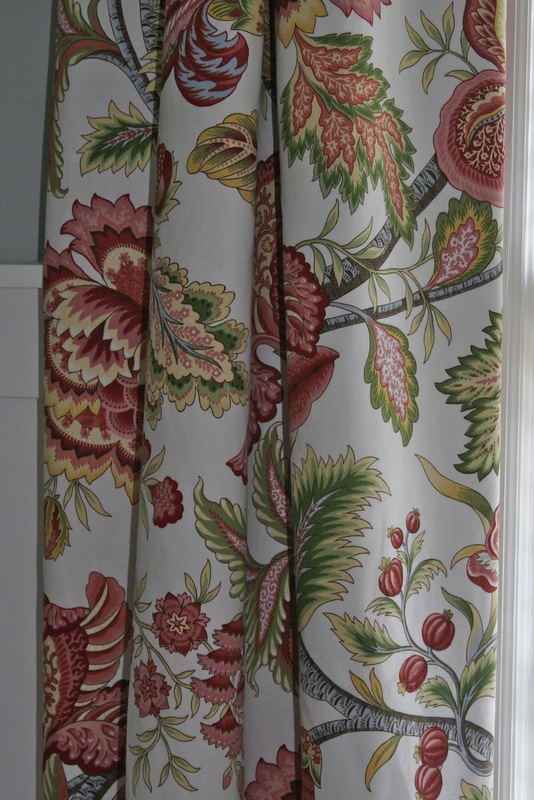 I've never been much of a "floral" person, but I do really love the colors in the curtain fabric. I think it's a print that can grow with Amelia ... the colors are youthful and fun, but the print itself isn't juvenile. The two panels were made by the very talented Melissa, and I highly recommend her services! She added blackout lining to them for me (for a small additional cost) because Amelia's room faces East ... I need to be able to block out that bright, early-morning light. 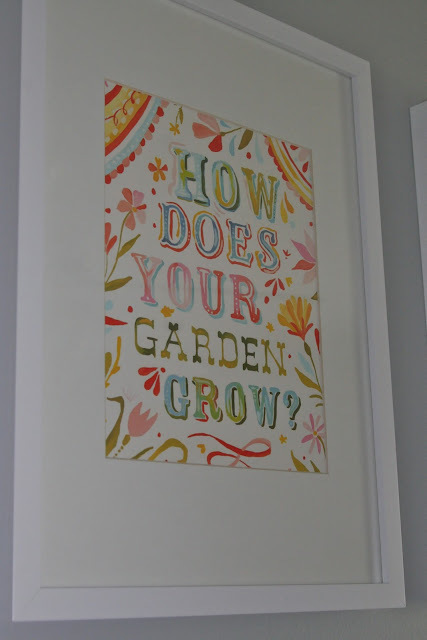 I can't thank Rene enough for her keen eye in helping me with the design for the nursery. I adore the way it came out, and I look forward to enjoying many, many hours in it with Amelia! Be sure to check out the details on Rene's design services here. Love the nursery! It's so pretty!!! That is amazing!! 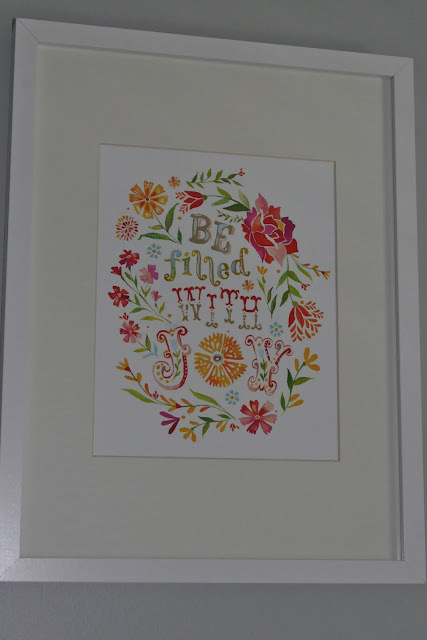 It inspires me to keep perfecting my oldest's room. 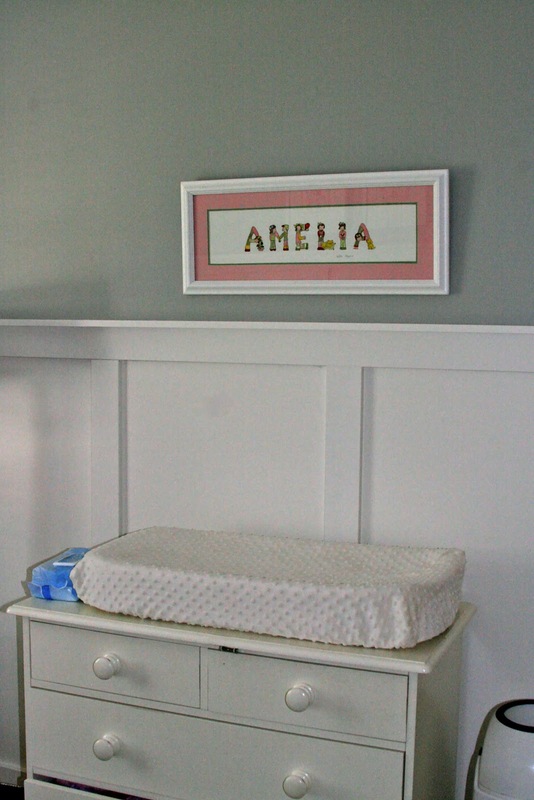 We kept the nursery for my youngest as I really did like my green and off white little nursery. 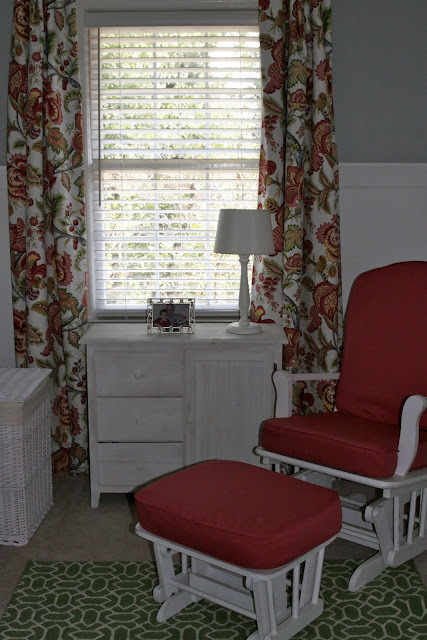 We moved my oldest last year into the guest room and I did work hard, only room that has a chair rail now, but I still need to add some things. Wow! What a treat to see everything come together! Are you Supermom or what? You just had a baby and here you are already back at it. You are an inspiration to us all. I am so happy that you like the nursery Katherine. The nursery is beautiful. How fun that must have been changing it up for a baby girl. I LOVE that water color painting. Baby Amelia is one lucky little girl! Such a beautiful room!